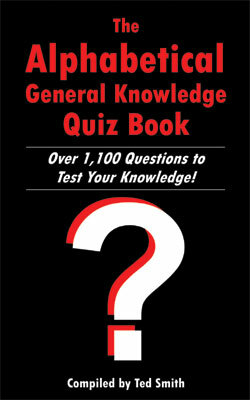 The Alphabetical General Knowledge Quiz Book: Over 1,100 Questions to Test Your Knowledge! Brief Description: Do you enjoy learning new things? Are you knowledgeable about a wide range of topics? Or perhaps you are a quizmaster looking for new material? Whatever the motivation for buying this quiz book you are sure to like these alphabetically linked questions – all of the answers begin with the same letter and are arranged in sections from A-Z. Containing over 1,100 brain-teasing general knowledge questions, The Alphabetical General Knowledge Quiz Book has been designed to cater for a broad range of abilities and the first letter of each answer is provided to give you a clue if you are on the right lines. Packed full of fascinating facts, this book is both fun and educational, and an excellent tool for learning. Choose a letter at random or work your way through the questions from A-Z. This quiz book offers a good way for the whole family to broaden their general knowledge, so why not challenge your children and find out who is the trivia champion in your house. About the Author: Ted Smith was born in Sheffield in 1938 but lived the first 27 years of his life in a mining town in South Yorkshire. In 1961, Ted graduated from King's College University, Durham (later Newcastle University) and pursued a career as a teacher. He taught foreign languages in his local Comprehensive School for seven years before moving to Marske-by-the-Sea in Middlesbrough, where he still lives today. Although retired, Ted leads an active life. He has always enjoyed cricket and came out of retirement, aged 43, to play for Marske third team. Ted also plays golf and is a member of Saltburn Golf Club. At 75 years of age, he still plays with a handicap of 13. Ted has been compiling questions for quiz nights for over 30 years and is now using this expertise to create quiz books. The idea for alphabetical general knowledge quiz books, stemmed from his past experience as a quiz master. Ted is married with two grown up daughters and five grown up grandchildren. Ted Smith has put together a great book. If you love your general knowledge questions, there are many here for you all listed in A-Z fashion. Great for those long train, plane or car journeys and a super book for anyone who organises quizzes too. Highly recommended.